The Dusit Thani Hotel showed off the best of its food and beverage skills to take 8 top honors at the recently held Pattaya Bartender Competition. The winning drink mixers and chefs won 8,000 baht each in the Aug. 28 contest hosted at the Dusit’s Napalai Convention center, beating out the Zign Hotel and Long Beach Garden Hotel & Spa for the most number of top awards collected. Pattaya City Councilman Rattanachai Sutidechanai opened the popular annual bartender challenge, which featured contests in a broad range of F&B skills, from fruit carving to table setting to ice carving, and of course drink mixing. Juttaporn Daosawa and Suphat Kanongphat from the Dusit Thani Pattaya accept the winning award in the ‘Wedding Cocktail /Canapé & Fruit Carving’ competition from Attapol Wannakij, director of TAT Pattaya Office. A full slate of local political and tourism-industry officials were on hand for the event, which was capped off by an evening “luk thung,” or country, party in which guests dressed in traditional Thai country costumes. Pattaya spokeswoman Yuwida Jeerapan stole the show, dressed as a classic luk thung singer when she dueted with Thachaya “Keng” Prathumwan, winner of The Voice Thailand television talent contest. 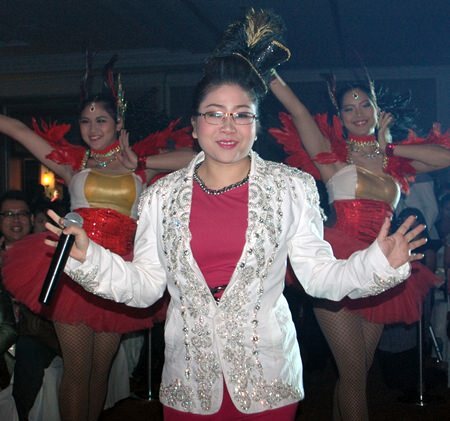 Pattaya spokeswoman Yuwida Jeerapan all dressed up for the “luk thung” party. 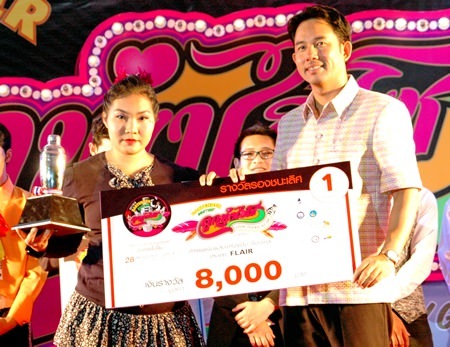 The competition, which carried the theme “Luk Thung Hi-So,” featured the classic cocktails and “flair” mixing competition, and a “Ms. Bartender” contest for women. Other events covered “romantic high tea,” ice carving, wedding dinner table setup, wedding bouquet flower decoration, wedding cakes, and wedding cocktail/canapé fruit carving. The Long Beach Garden’s Analtachai Meenopkij won the headlined “classic” bartender competition over Itthiphol Sangh-ngen of the A-One Royal Cruise Hotel and Mai Worayotha from the Zign. 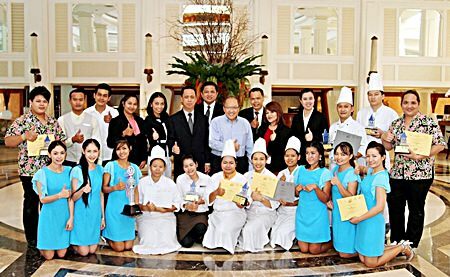 A proud Chatchawal Suphachayanont, general manager of Dusit Thani Hotel Pattaya (standing rear center), poses with his management and winning F&B staff members following the conclusion of this year’s Bartender Competition. Vichan Fuangsuwan from the Zign took first in the “flair” bartender category, followed by Dao Thiempa from Centara Grand Mirage Beach Resort and Theerachai Khemvichai from the Long Beach Garden. The Dusit Thani took first place in the wedding cocktail/canapé-fruit carving contest, with the Tsix5 Hotel taking second and Woodlands Hotel & Resort third. 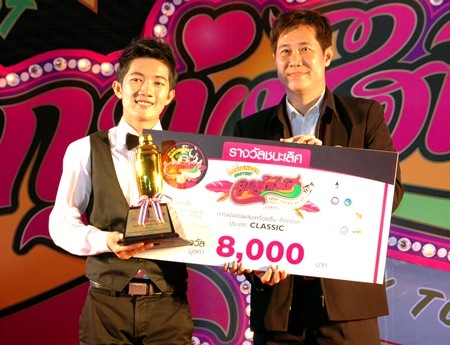 Anantachai Meenopakij from Long Beach Garden Hotel & Spa accepts the winning award in ‘Classic’ Bartender category from Banjobg Banthunprayukt, a member of Pattaya city council. The Dusit also won first in the wedding freestyle competition. The Long Beach Garden won second and Zign third. The Long Beach Garden came out on top in the wedding bouquet and wedding cake contests with the Zign finishing second and Dusit third in the bouquet category; and Woodlands and Dusit taking second and third in the cake competition. Dao Thiempa from Centara Grand Mirage (left) was the only woman in the ‘Flair’ Bartender contest and took first place together with the 8,000 baht prize. The Centara Grand Mirage Beach Resort also won two first place prizes for wedding table setup and romantic high tea. The Dusit Thani took second in both while the Long Beach Garden took third for table setup and the Zign third for high tea. The top three in the ‘Flower Decoration Wedding Freestyle’ category pose on stage. Finally, for ice carving, teams from the Amari Orchid Resort & Tower won both first and third with the Dusit Thani taking second. 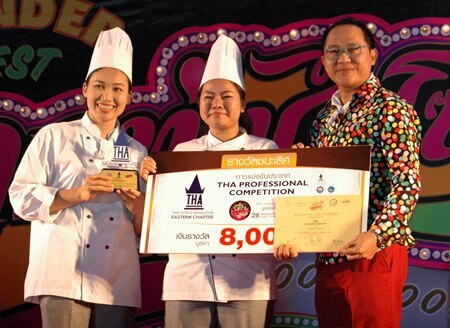 This annual event, put together by Pattaya City Hall, Thai Hotels Association Eastern Chapter and the F&B Association is one of the most anticipated competitions in Pattaya in which F&B staff from every contending hotel are given the opportunity to compete and showcase their talents in their respective professional fields. Participants from the 10 teams in ‘Miss Pattaya Bartender’ event pose on stage with Pattaya city mayor, Ittipol Kunplome.